Galileo Telescope Makers is the brainchild of Nilesh Vayada, a chartered accountant with a passion for astronomy. Early in his career Nilesh responded to his inner calling and converted his passion into a profession. His determination and grit are an example for amateur astronomers to overcome the traditional barriers of physics and mathematics and mark their place in space. As a child Nilesh was always fascinated with the sky. He spent most of his nights on his terrace, watching and wondering. Those were the days when Halley’s Comet made its dramatic appearance. That event formalized his interest in astronomy, after which he built his first telescope. His desire to explore the skies drew him away from his work as a CA in the family business. He began his new innings by building low-cost telescopes for fellow astronomers and friends. From those modest beginnings, he rose to create GTM, one of the country’s largest astronomy stores, and the only online astronomy store. He is now dedicated to the service of Indian astronomy. Today there is no looking back. 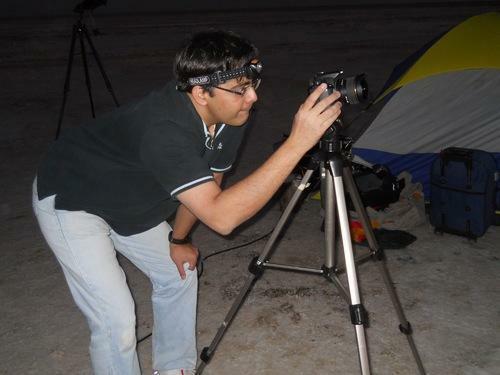 Despite his very busy schedule, Nilesh finds the time to guide other amateur astronomers and astronomy groups. To him, a customer is not just a buyer of a telescope, but a fellow astronomer with a budding potential. He strives to share his success with every enthusiast he meets. He was recognized by the Department of Science and Technology, Government of India, for his total solar eclipse photograph of 1995. He was National Coordinator for Sidewalk Astronomy during International Year of Astronomy (IYA) 2009, in association with TWAN-ISAN. He has received extensive media coverage for his contribution to Indian amateur astronomy, and has been featured in a number of articles, TV and radio programmers. Astronomy, photography, spirituality and social work add meaning, depth and excitement to Nilesh’s life. His recreational interests include adventure sports, long travel and reading. Nilesh is an eclipse chaser. Over the past 15 years, he has covered almost every total solar eclipse in the world. He has captured some of the most glorious celestial sights either on film or screen. Nightfall on a Sunny Morning: A precursor to the total solar eclipse of 1995 with information about the eclipse path, the moon’s trajectory, visibility at various locations and what to expect when. Nilesh’s passion has led him to accomplished path-breaking success in some endeavors not often seen amongst amateur astronomers: He has built a 20” telescope, India’s largest amateur telescope. He created an eclipse calendar for the 2006 Turkey eclipse.